FCP Euro announced today that it has expanded its product offering to include a full range of Audi replacement for its customers. Audi parts are highly credited as a leader in the auto parts manufacturing industry. The addition of this outstanding brand and its line to the FCP Euro lineup will let the company provide a greater level of choice for its customers and will further demonstrate FCP Euro's commitment to providing the best products at the most affordable prices in the online auto parts industry. FCP Euro, CEO, Scott Drozd, announced today that the company has expanded its catalogue include a full range of Audi parts online through the FCP Euro website. 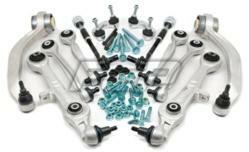 Included in this expansion, FCP has added over 4,000 Audi specific parts to its catalog, covering all major parts of the vehicle, including, Audi brakes, suspension, timing, engine, cooling, and more. Adding the expansion of Audi replacement parts to the FCP Euro catalog ensures that FCP’s customers enjoy the best possible quality and prices when purchasing these outstanding parts. FCP Euro specializes in providing the most comprehensive array of OEM auto parts for Volvo, Mercedes, BMW, Volkswagen, Audi and other quality European imports. ASE certified staff members are available to assist customers in selecting and installing the parts sold through the FCP Euro website. This commitment to customer service allows FCP Euro to provide the best possible shopping experience for consumers who visit the company's online auto parts store. FCP Euro is dedicated to providing the highest quality OEM auto parts at the lowest prices in the automotive marketplace. FCP Euro delivers BMW, Volvo, Volkswagen, Audi, Mercedes and Saab auto parts to its customers throughout the world. FCP Euro orders its parts direct from the manufacturer and ship from their warehouse in Old Saybrook, Connecticut. This allows FCP to pass the savings along to their customers and provide them with the best possible deals on the full range of European auto parts.